Know him? If not, you should make an effort to connect – see how you relate to one another. You might be able to find him on the internet, but only if you’re determined. My advice to you: be determined. This guy has a lot of influence in deciding how much nuclear radiation the government says your body can withstand before suffering death or other life-threatening illness. I had never heard of Reference Man before attending Hanford Happy Hour, and this frightened me. I mean, I don’t consider myself an expert on anything related to the nuclear industry or cancer, but I’m a relatively educated individual, and I consistently seek out information about things happening in our environment that could affect my health. So after the discussion group, I decided to increase my understanding by doing a little of my own research. The first interesting thing I noticed in my search for Reference Man was that apparently no one is searching for Reference Man. I typed “Reference Man [space][space]. . . [space] . . .” into Google and the only auto-populations I got referred to some obscure U.K. mumbo jumbo. The Reference Man that essentially governs all U.S. citizen’s rights against exposure to lethal doses of radiation… doesn’t auto-populate. 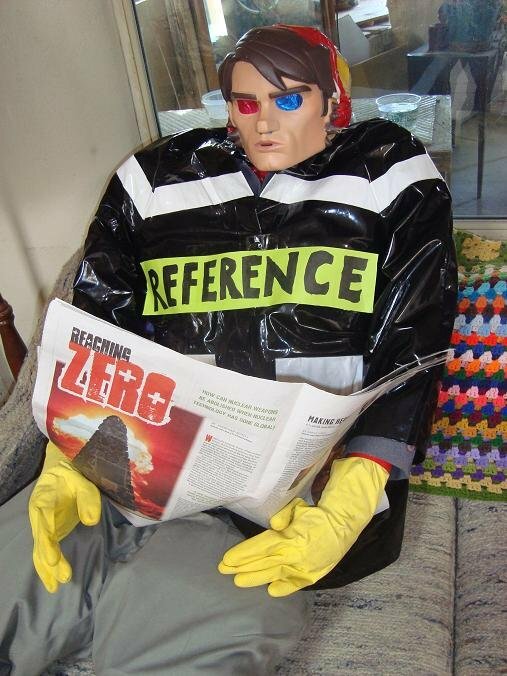 Reference Man is a 5-foot-7-inch white male who weighs 154 lbs. and is somewhere between 20 and 30 years old. He is also “Western European or North American in habitat and custom,” whatever that means. (See International Commission on Radiological Protection, Report of the Task Group on Reference Man, 1974.) Reference Man is essentially almost no one, but he sets the standard for everyone. Funny how frequently that happens in our culture. Seeing as how Reference Man came down the chain from Congress, we have to wonder who Congress intended to protect or represent with Reference Man. Congress has always been predominantly old white dudes (1974 was no exception) and even they aren’t protected by Reference Man. So who was Reference Man supposed to be? Politicians’ sons? Daughters, wives, neighbors, and grandchildren of politicians? And what about you and me? And what about the hundreds of millions of other people from various cultural and ethnic backgrounds who constitute the United States? The U.S. has a wildly diverse population, yet Reference Man protects almost no one. Without knowing who Congress intended to protect with Reference Man back in the 1970’s, we can and should speculate on who it should protect now. A number of arguments state Reference Man should protect everyone by protecting those in our country who are most vulnerable (i.e. the young, the elderly, minorities, those who actually live near facilities that release radioactive particles, etc.). On the other hand, there remains the question about how on this green Earth our government could ever afford to protect everyone. Okay, so, if the government can only afford to protect some of its citizens, then where should it draw the line and who should make that decision? Tax payers? Should Reference Man really be called Reference Taxpayer? What are the inherent problems with drawing the line based on one’s ability to financially contribute to the overall system? Where would this leave the disabled, the unemployed, the young and old, who are unable to work? And what about how the Internal Revenue Code functions for different marginal tax brackets? Would this hypothetical “Reference Taxpayer” ultimately only protect the wealthy? And what about the national economic consequences of the heightened nuclear industry standards that would result from legislation enacted to protect a broader range of people? Good grief. So many questions. I understand that determining what Reference Man should be and who it (he?) should protect is obviously a very complicated and consequential series of decisions. However, considering that the present criteria protects almost no one, for no apparent reason, I have to wonder why Congress has so far declined to revisit the issue. I mean, this is Congress’ job after all. Is it simply easier to protect no one than to decide which lives to protect and which to risk for the cause of producing weapons of mass destruction? ← Free Ice Cream Anyone?